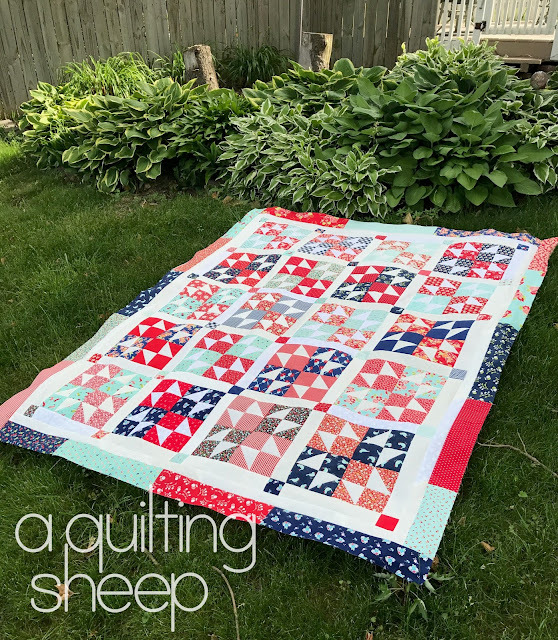 I am calling this one Red, White and the Blues because I didn't have enough navy prints to make it scrappy. In other words, each navy print would have to be used several times and I didn't want to do that. Instead I added in the aqua blue instead. I am slowly, but surely making barely any dents in my Bonnie and Camille fabrics. I had an ever growing pile of white tone on tone fat quarters in my stash. I never knew what to do with them. 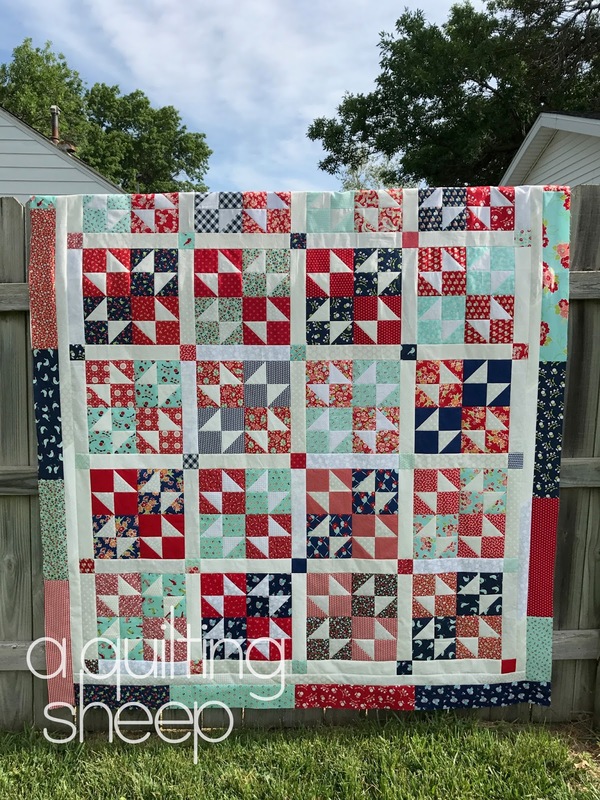 My Friendship Love quilt used many shades of white and I liked how it turned out, so decided to do the same thing with this quilt using as many white tone on tone fabrics as I could. I mixed them up and used them in the blocks and as well as the sashing. My pile of white tone on tone fabrics are much smaller now and I think it makes the quilt look interesting. Until I get around to making the back and getting it quilted, it will rest on my upstairs railing, along with a few more quilts that need attention....SOON! I love it! I have a B&C fetish also, and I'm still looking forward to their new line coming in August. Just lovely! I've been mixing it up in my background, sashing, etc. fabrics and like you, I think it makes the quilt more interesting. Why use one fabric when you can use 20? More is more! I am always amazed at what simple squares and triangles can do (and a talented stitcher). This is beautiful. So very pretty...I love the combinations of blues. 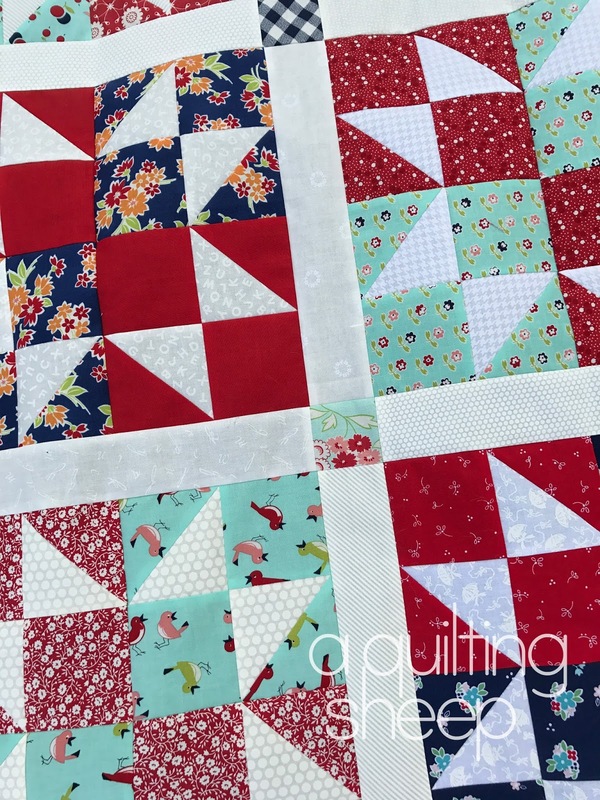 Your quilts are (as always) amazing. I too have been trying to sew from my stash. What a beautiful quilt. I love the use of the aqua blue with the red, white, and blue. I love white on white fabrics. Brilliant Amy - I love the mix of blues and the different whites, just lovely! yes. this is a very pretty quilt. You are very very good, Amy, just doing and being focused and such. Very cute! 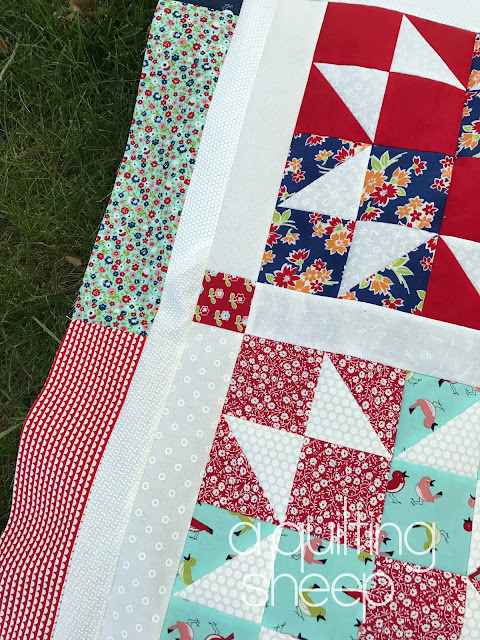 Love the combinations and flexiblity you used in selecting your fabrics. Bravo. So pretty! Love the colors and the pattern. The white on whites kicks it up a notch. Great idea. Aqua is a blue. It looks great! 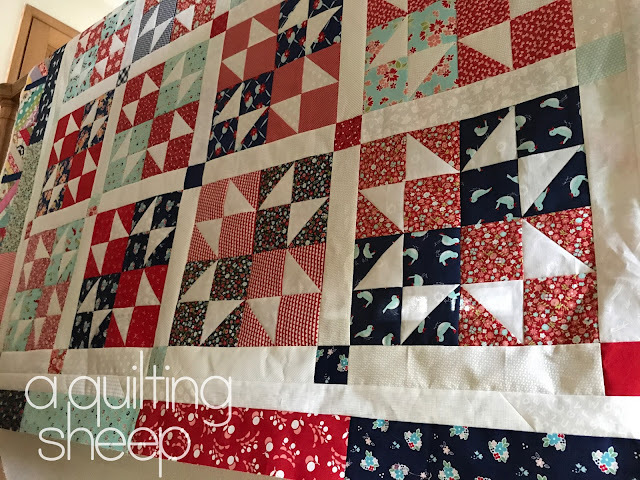 That's a gorgeous quilt! The fabrics work really well together. I love the quilt and as a Bonnie and Camille fabric fan, it is fun to see you use your fabrics in such creative ways. Thanks again for your inspiration. I am looking forward to getting back to my sewing.